Having been tasked by Julius Caesar to map the known or Roman world, and seeing the resulting map displayed in Rome, it was perhaps quite certain that following emperors would wish to add their conquests to that map. To achieve that Britannia had to be surveyed. That the Roman Army and Administration produced and used proper maps not just itineraries is now accepted. Establishing how the information was obtained is the challenge. The Roman Empire was a growing organism, ever expanding from its origins. Its final flowering was made possible in part by the invasion of most of Great Britain, Britannia Insula. Recorded on each of the Ebstorf, Hereford and Cornwall mappa mundi is a fascinating glimpse into map making history. Before his demise in 44BCE, Julius Caesar gave instructions for a “World Survey”. This was no doubt the “Roman World” and its peripheral countries. (StM1) The Ebstorf mappa mundi, some 3 metres square, contains a poignant vignette of Julius Caesar issuing those instructions to the four surveyors, who were probably Greek specialists. A similar vignette is on the Hereford mappa mundi. The maps were thus a history of the world in pictures for the illiterate populace. Preceding these medieval mappae mundi were the late 4th century CE texts of Julius Honorius and Aethicus; they are probably the basis of the story that has been added to those mappae mundi. The four surveyors would have had teams of Roman Agrimensores to assist them. But even so, this survey took some 32 years and was complete c18BCE. The resulting map was displayed in Rome. However, Britannia was not part of the Roman Empire until after the Claudian invasion of 44CE. We can therefore assume that the Roman occupation of Britannia included a survey of this one of the last parts of the Empire. It was perhaps to complete the map in Rome, and most certainly to transmit data throughout the Empire and obviously to Alexandria. At RATAE/Leicester, which is very close to the 300/100 centuriae marker, we find a second alignment; it is the GARTREE ROAD, a Roman road towards CAMULODUNUM/Colchester. This road is set precisely perpendicular to the Foss Way and is a direct alignment to Camulodunum, of some 230 centuriae or 163 KM. Camulodunum was the first Colonia and capital of this Roman Province. 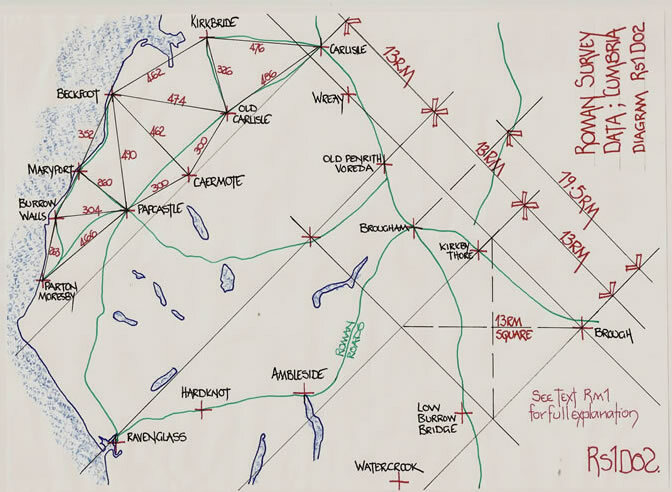 Therefore in the landscape of Britannia is a very precise layout which could only have been achieved with adequate prior geographical knowledge. Add to this the fact that there are other parallel alignments and fort positions strictly set out to repetitive distances following the sequential Legionary advance and thus construction dating, then the basic parameters for the map become available. Thus, we see an internal forma or skeleton appearing for the map. That is the macro detail whilst the devil is in the micro detail. The micro detail necessary to establish the accurate positions of rivers, mountains, valleys and other major/minor geographical features is obtained in a similar manner. By studying the location of the Roman forts built sequentially after the Claudian invasion, particularly the final phase of subjugating what is now northern England, we can readily indicate the survey work required for the local geographical details to be appended to the map. From DEVA/Chester and EBORACUM/York the next advance took place. In the landscape there are forts precisely located such that they form a straight alignment along a river valley and across moor-land, and the distances are repetitive. From Newton Kyme to Ilkley, 23RM: from Ilkley to Elslack, 13RM: from Elslack to Bainbridge, 27.53RM: from Elslack to Overborough, 27.42RM: from Overborough to Ribchester, 27.54RM. This placement across the Pennines from Yorkshire to Lancashire could not have been established without prior geographical knowledge being available. Thus, as history tends to confirm, a good preparatory incursion and survey took place prior to the final two Legion northwards march. Proceeding north towards LUGUVALIUM/Carlisle, we can establish the next survey, another tour de force. From North Yorkshire the Roman Road, now the A66, is to BROUGH, near the head of the River Eden. From Brough fort a 45 degree or 1:1 ratio alignment has been set out to WREAY FORT, based upon the side length of a triangle formed with 24 Roman Miles. This is part of the basic surveying system of the Agrimensores or Geometres. The Roman Land division system is based upon a square, the actus quadratus of 120 x 120 pedes (feet). The simplest pseudo Pythagorean triangle to use for such measures is 12:12:17, i.e. 2 x 12 x12 = 288 and 17 x 17 = 289. Substitute the 24RM and the Brough to Wreay line is 34 RM. The actual alignment is meant to locate Luguvalium/Carlisle, 39RM from Brough. A simple extension of the hypotenuse line, the survey line achieves that. The proof for this hypothesis is so very simple. The route from Brough to Carlisle is marked by four forts, namely Kirkby Thore, Brougham, Old Penrith/Voreda and Wreay. From Brough to Kirkby Thore on the survey line, or design alignment at 45 degrees, it is 13 Roman Miles, i.e. one third of 39RM. From Kirkby Thore to Voreda it is 13 RM and from Voreda to Carlisle it is 13RM. Then, from Carlisle westerly around the Cumbrian coast-line and into its hinterland, The Lakes, we find the same repetitive distances to forts which were established sequentially in the period following the Claudian invasion. The position of these forts when plotted on plain parchment provides the skeleton framework onto which the coast-line and geographical detail can be appended. History tells us that the “Roman Navy” followed the legions up the coast from the Severn Estuary at GLEVUM/Gloucester, to Chester and thence to Carlisle. It takes little imagination to see that this combination would give more than adequate information to the Roman map maker, (be he Greek or Roman), and indicates the transference of data that could take place in both written and map form to both Rome and Alexandria. Marinus is actually quite correct and when the co-ordinates given by Ptolemy are used, he places it in the same position. A study of the Roman survey works reveals the real picture. From London Bridge to the East Gate of Noviomagus, the design line for the road, Stane Street, is a precise 3:5 tangent ratio to north and as such it is parallel to the Foss Way alignment. And yes, Marinus has the correct distance. The data for the Roman map construction is set in the landscape. The world survey commissioned by Julius Caesar and the world map which was completed before the beginning of our current era is the only tangible evidence of a proper Roman Map. It is possible that a Roman Map of Britannia was extant until the sacking of Monasteries took place. It was probably used as a guide for such maps as the enigmatic ‘Gough Map’ (Gm1) and the basis for early geographers in England (Cs1). The Romans by their careful placement of forts and road alignments have bequeathed to us a valuable survey asset which has hitherto been ignored in the cartographical and historical literature. Note. This essay is a melange of the texts freely available on this site. They contain complete references and bibliographical details. The diagrams are all by the author. Dilke, O. A. W. (19610 Maps in the Treatises of Roman Land Surveyors. The Geographical Journal, 127.4, 417-26. Ferrar, M. J. (2005) The Venerable Bede and the Tabula Peutingeriana. The Cartographic Journal, 42.2, 157-67. Revised version reference Tp1 on this web site. Ferrar, M. J. and Richardson, A. 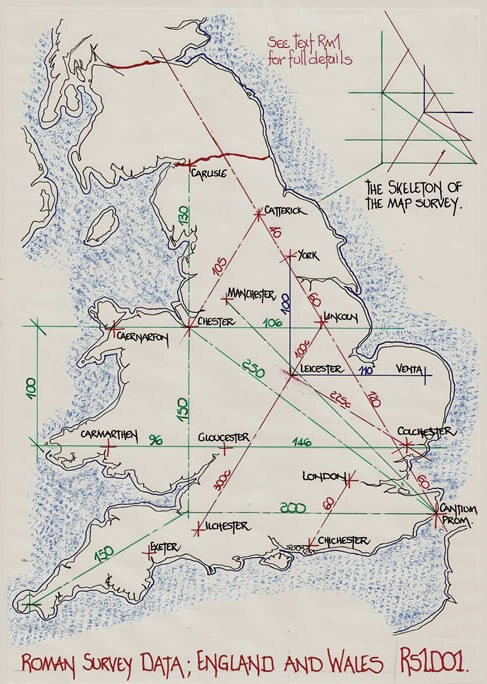 (2003) The Roman Survey of Britain. British Archaeological Reports, British Series 359, Archaeopress, Oxford..
Harley, J. B. and Woodward, D (eds) (1987). The History of Cartography, Vol 1, Cartography in Prehistoric, Ancient, and Medieval Europe and the Mediterranean. University of Chicago Press, Chicago, USA. Sherk, R. K. (1974) Roman geographical exploration and military maps. In Aufstieg und Niedergang der Romischen Welt ( eds. Haase, W. and Tempotini, H.) De Gruyter, Berlin, II. 1, pp. 534- 562. Wiseman, T. P. (1992) Julius Caesar and the Mappa Mundi. In, Talking to Virgil: a Miscellany. University of Exeter Press, Exeter, pp22-42.